The University of Toronto full-time MBA at Rotman School of Management combines 16 months of study with a four-month opportunity for an internship. In their second-year, students may choose to specialize in a particular discipline to guide them toward a specific career path. 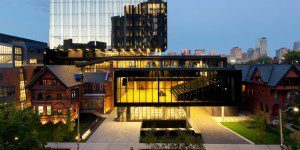 The full-time MBA program at Rotman takes 20 months to complete. Sixteen months are spent in classes and four are spent completing an internship. Students in their first year will spend their time taking core classes that cover fundamental business skills such as accounting, ethics, strategy, operations management and economics. Students will also complete a capstone course. In their second year, students can choose electives. They may pick an MBA major or take a variety of electives. Majors include Brand Management, Consulting, Investment Banking, and Real Estate. The full-time MBA class of 2019 consists of 350 students from 35 countries. The average age is 27, and the class is approximately 60 percent male and 40 percent female, with an average of 4.3 years of professional experience. The average GMAT and GPA earned by full-time students are 665 and 3.5, respectively. Forty-nine percent are Canadian, and 52 percent identify as international. For the most recent MBA class, 80 percent of full-time MBA graduates had a job within three months of graduating, and 85 percent had a job within six months. The average starting salary of Rotman graduates was $92,524, with an average signing bonus of $17,337. Financial services was by far the most popular industry chosen by 2016 graduates, with nearly 44 percent of students accepting related roles. Consulting followed at almost 21 percent, and consumer goods claimed nearly 10 percent of students. For the Class of 2020, the University of Toronto full-time MBA degree tuition for both years is $104,380 CAD for Canadian citizens and permanent residents, and $116,610 CAD for international students—excluding significant ancillary fees (please note that tuition fees, University incidental fees and the Rotman ancillary fees are set annually and are subject to change). The estimated minimum funds a single student would need for living expenses for the first 12 months in Toronto $20,856 to $28,756. Applicants to the MBA programs must have completed a bachelor’s degree or its equivalent for admission. The application fee is $175, and required are one written essay and one reflection question, one video interview with a timed written response, two reference forms and a current résumé. Note: On average, applicants have four years of work experience, but only two are recommended, and there is no requirement. Applicants should have a minimum 3.0 GPA with official transcript sent directly from each institution where they earned a degree, as well as a GMAT or GRE score. The GMAT range for the 2019 class was 560-740 and the average score was 665 (GMAT requirements waived for applicants who have completed CFA III). An English-proficiency score is required from all applicants who have degrees from institutions in which English is not the language of instruction or examination. After the submission of their application, applicants will be contacted to complete an interview. Due to the competitive nature of admissions to the program, successful candidates tend to exceed the minimum requirements.